Rangers legend Ally McCoist has poured cold water on Dave King’s claim that the Ibrox side are “within tangible reach” of becoming the dominant force in Scottish football. Club chairman King made his assessment of manager Steven Gerrard’s team while announcing that the cost of season tickets at Ibrox would be rising by five per cent ahead of the new campaign. However, former striker and manager McCoist has countered that claim, stating that Rangers have a long way to go before overtaking Glasgow rivals Celtic. The Parkhead club are five points from securing an eighth successive title and odds-on favourites to complete a third successive treble by beating Hearts in the final of the William Hill Scottish Cup next month, and McCoist believes they are not about to relinquish their status as the country’s major force. At this time last year (prior to the appointment of Steven Gerrard as manager), King was equally bullish. “Whoever is appointed must be able to meet the unique challenges of managing Rangers and ensuring IMMEDIATE success,” he said. In September, 2015 – six months after seizing control of the boardroom and with Rangers still in the Championship – he predicted title success by 2017. However, during King’s reign, Rangers have reached only one major final (losing to Hibernian in the 2016 Scottish Cup showpiece) and they currently trail Celtic by 11 points. McCoist, who played a crucial role in Rangers’ nine-in-a-row era under Graeme Souness and Walter Smith, he disagrees with King’s claim. 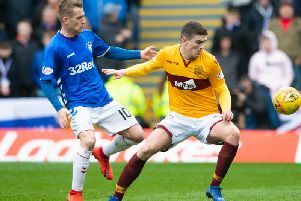 “It depends how you define ‘tangible reach’ but I would certainly see the dominant force as being the number one team in the country and Rangers are a good bit off becoming the dominant force in Scottish football,” he said. “I hope it happens sooner rather than later. They can [still] stop ten-in-a-row but a lot of things have to happen. It’s a massive summer for both clubs in terms of transfer activity. “But Celtic look to me as if they’ve still got better players so how do you compensate for that? You need to get better players. “I would guess Steven Gerrard and Gary McAllister, who are very clever men, would maybe know they’re not as close as Dave has suggested. “But I don’t think Steven will be upset at all at the statement. If I was him I would be agreeing with him and saying: ‘That’s good; now let’s go and make sure it happens’. But he needs backing and I genuinely think he will be backed. “But I still think there’s a good bit to go before Rangers can be anywhere near considered the dominant force in Scottish football. “I understand it’s season-ticket renewal time so I get all that, but I reckon they need three or four players and I don’t know if they’ll take money for Alfredo Morelos or James Tavernier. l Ally McCoist was speaking at The Emmie Smillie Charity Foundation event at which they donated a whopping £300,000 spread across five charities – Kilbryde Hospice, Beatson Cancer, St Andrew’s Hospice, St Margaret’s Hospice, The Prince and Princess of Wales Hospice and Marie Curie. Ian Durrant, Alex Rae and Neil Lennon also attended the event.